Sure, it was a shame that I didn’t get to see Beyond Creation play on a boat in Paris, just one day before their UK stint. That said I can’t imagine a more adequate set-up than the Satan’s Hollow rock venue in Manchester. The stage was actually less of a stage and more of a circular bandstand, around which the audience were able to observe the show, three-sixty. Personally, I’d take that over the regular kind of stage any time. It was possibly the most personal interaction between band and crowd I’ve witnessed since being jam-packed in a bar with Gojira following low ticket sales, way back in 2009. Anyway, back to the present: After opening the night in his Brought by Pain guise, guitarist Kevin Chartré described the experience as being more like a party than a performance. And Beyond Creation drummer Philippe Boucher joked that the set-up would be a great opportunity for a circle pit. 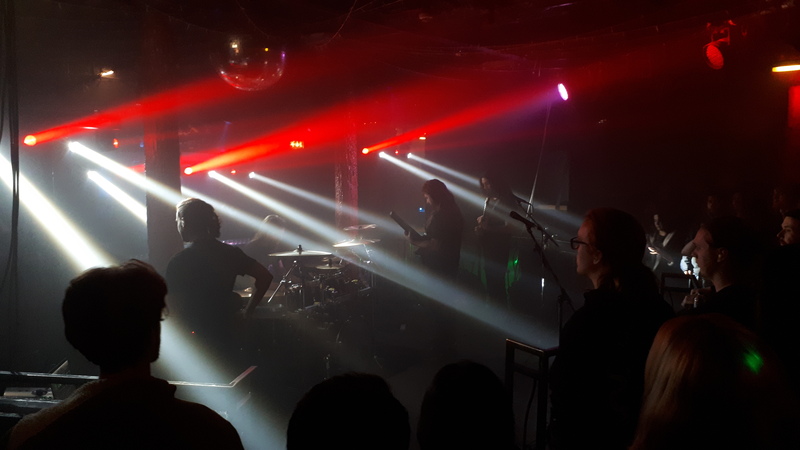 In virtually no time after the venue doors opened, act one of the night’s tech death spectacle went underway in the form of Brought By Pain. For anyone unbeknownst, Brought By Pain are Beyond Creation‘s sort of cousin band, currently featuring two of Beyond Creation‘s members: Kevin Chartré, and bassist Hugo Doyon-Karout. But it was guitarist, Dominic Petrocelli who took advantage of the close proximity with fans, exiting the bandstand on several occasions to mingle with punters, pull faces and display his guitar-playing flair with not a single hiccup. Consider Brought By Pain as the alarm clock to the evening’s festivities. It was a fully solid beginning to the night. And though attendance was fairly thin at this point, Brought By Pain brought the pain full-pelt, and it served as more than a warm up exercise for Hugo and Kevin. All five band members were visibly having a great deal of fun. One down, and three to go; Cue what where arguably the underdogs of the night, Entheos. With the other three bands having crossed paths multiple times in the past, the tour seemed very much like a family affair, with Entheos as the US-based honorary guests. And so, the pressure was on for them to make a distinct impression… which they did, and then some. The heavy as hell cybernetic hollers of Entheos‘ music were played with maximum fluidity, and vocalist Chaney Crabb roared like a titan throughout, ruling the venue with every scream she let out. Anyway, talking of Gorod, the next band up brought with them a highly formidable light show. And what did we all expect? Gorod‘s set was a speedy retrospect of some of their most loved material, a fair chunk of which was from the Process of a New Decline saga of their career. Vocalist Julien Deyres worked the crowd into a frenzy, and threw his full weight into the performance. The venue had filled up at this point, and the audiences’ gaze were fixed unconditionally on the band. The instant the soundcheck finished, Gorod switched on like a light. And the circular construct of the stage meant that I was able to spend much of the set gawking in a trance at Karol Diers’ drumming, which was, well, unreal. Gorod‘s set finished on the crushing jazz tirade of “Disavow Your God”. The audience banged heads a lot, the band gave it their all, and bass player Ben Claus licked his fretboard during the closing minute. Gorod concluded their run in explosive fashion. Were the night to have concluded there and then, the appetites of the audiences would have been surely well fed. Yet still to come was the headlining band. Let’s keep in mind that this was a Beyond Creation tour which, on social media, was heavily modeled on the artwork of their latest album, Algorythm. So guess what they played, from start to finish! Yup, we got the full album, every note of it. And was that the end of the show? Nope. No, it wasn’t. After this, we got an ensemble of Beyond Creation classics across both previous albums. They did a show to end all shows. They displayed a true love for their fans and the fans gave it right back. And the same can also be said for the other three bands. This 2018 tour was one built on charisma and fun. For a group of musicians to have such an assiduous approach to their musicianship, their gear, and their craft in general was impressive enough. But the fact that they had such a sociable zest for life, made the show extremely special; Once in a lifetime I’d add. Here’s to seeing them all again someday. If you’re not familiar with any one of these bands, you can start your Beyond Creation / Gorod / Entheos / Brought By Pain journey by visiting their respective Facebook pages. Previous PostImmerse Yourself in the Beauty of Fetherstone's "Ticket To You (Unspoken Stories)"
Next PostSaint Sadrill Mesmerize Studio Rouge with Songs off "Pierrefilant"